Hi, This is Monique form Cutlery Advisor. Chef Monique. Born in Florida, Monique has over 10 years of culinary experience. Since January 2014 until this day, she occupied the position of Executive Chef at the CADEUL at Université Laval. 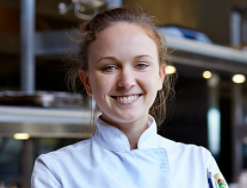 In the vicinity of 2003 and 2004, Monique Laferte had the chance to lead traineeships in such eminent locations as Georges Blanc in France (3 stars Michelin), Fairmont The Queen Elizabeth and Le Toqué eatery. Rapidly, She worked his way up through some lofty foundations, remarkably with Chef Modat at L’utopie eatery where She figured out how to ace pale methods. She developed his insight into the culinary culture related with the different wine districts amid his three years at eatery Le Moine Échanson and moved toward becoming gourmet expert of the eateries at Loews Le Concorde Hotel before culminating cutting edge cooking systems at La Tanière eatery from 2012 to 2013. Four the most recent four years, she has been driving his group towards offering another and brassy culinary experience to the understudies and staff of the Université Laval.